Do you want to find, copy or index the texts of your PDF documents? If so, you should convert PDF to Notepad format first. A. Double-click your PDF file to open it. B. Press <Ctrl+A> to select all texts. C.	Press <Ctrl+C> to copy out the selection. D. Run Microsoft Notepad program. E. Press <Ctrl+V> to paste the copied texts. 1. Open Microsoft File Explorer and enter the PDF containing folder. 2. Select PDF file, and Press <F2> to rename it. 3. Press <Ctrl+C> to copy PDF filename without extension. 4. Press <Ctrl+V> to paste the filename to MS Notepad's "Save As" box. Above operations are just for convert ONE PDF to editable text file. If you need to convert 200 PDF documents, it's a very insipid job, and will spend you a lot of time. More seriously: a few PDF docs may have copying limitation, in this case, even you want to spend the time, but it is powerless to finish that. Step 2: click <Add PDF files...> button to add the PDFs which you want to convert to editable text documents, or just drag-and-drop them to the blank listbox. Step 3: click the biggest <Convert all> button, and waiting for done. 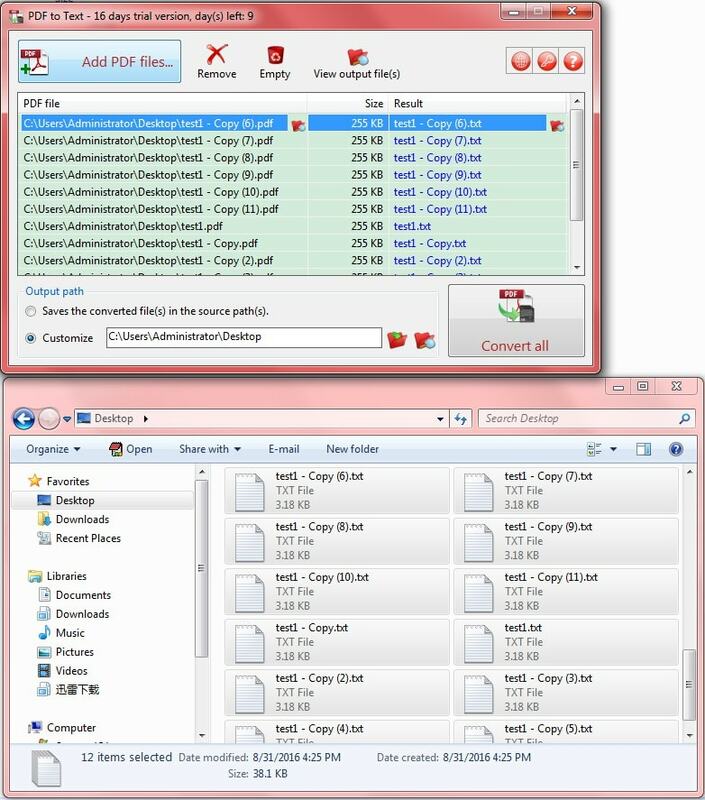 Screenshot: convert PDF to editable text file.